Bright, full-color photos of beautiful birds adorn the pages of this non-fiction children’s picture book. Common Backyard Birds is a photo album of common birds that you could see in your own backyard. Author and photographer Doris Dumrauf provides sharp, interesting photos and a description of what food they prefer to eat. Written in first person, the story introduces readers to North American birds, their eating habits, and lifestyles. The feathered edges on the images fade into the background color. The colorful, full-bleed background and stunning layout make for a professionally produced picture book that children, parents, and adults will enjoy reading. Every public library and school library should add this book to their shelves. Common Backyard Birds is an interesting book of photos of North American birds, but it also provides informative food descriptions and habitat information. Photographer and author Doris Dumrauf offers advice on what types of trees you should plant in your yard to attract these colorful birds. Dumrauf and her high-end camera must have been hiding in the shrubs, spying on the wildlife visiting her backyard in order to capture such stunning, exciting images. Add sleuth and researcher to her list of occupations as she uncovers the eating and living habitats of these winged visitors. The creative layout and a variety of image shapes add to the beauty of this sought-after book. 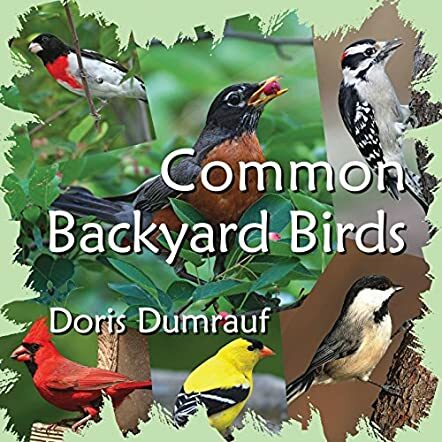 At the back of the book, Dumrauf provides tips on how to attract more birds to your yard, such as providing water to drink and bathe, a variety of food, shelter from weather and predators, and a place to raise their young.